We can even help organise your holiday groceries. Simply complete an online delivery with Coles and we’ll take care of the rest. And if you feel like a date night, that's easy too – after all, this is as much an escape for the adults as it is for the children. We have some amazing extras and professional babysitting services to help you re-connect while the kids are cared for. If that’s not enough, our property is one of the only places in Far North Queensland to boast direct beach access, so you won't have to go far to build those much anticipated sandcastles. Alamanda Palm Cove is also home to the highly acclaimed Nu Nu Restaurant and award-winning Alamanda Day Spa. Our luxury self contained beachfront apartments will easily accommodate 3-7 people and range from 85sqm for our one bedroom suites to our 250sqm four bedroom suite. So no matter how large or small your family, we have the space for you to truly get away. But it’s not all about us. 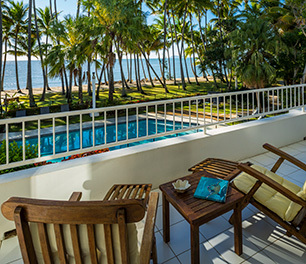 Palm Cove is also about the only place in the world where two World Heritage listed areas meet – the Great Barrier Reef and the Daintree Rainforest. From jungle surfing & jumping crocodiles; to Finding Nemo & Finding Dory – here is a playground for kids of all ages. Contact us today to start planning your family holiday in Tropical North Queensland. Call us during business hours on +61 7 4055 3000 and let us help you make the most of your stay. Spend the night beachside at Alamanda Palm Cove, and enjoy an a-la-carte breakfast in award-winning Nunu Restaurant the following morning. Swim, snorkel and dive, or just splash around. Explore an ancient land, or drop a line. Take your pick!